In the pursuit of enhancing my google search skills, today I stumbled upon a browser extension named “Google Search Navigator”. It offers some keyboard shortcuts to improve your google search. Google has already provided an experimental Keyboard shortcuts for navigating search results. Unfortunately, It seems like Google has removed this feature as of 2017-07-31. Luckily, a developer has created this extension to enhance keyboard navigation in Google search. This plugin is free and open source. So, you can get the code freely on GitHub link provided at the end of this guide. In this guide, we will see how to use “Google Search Navigator” extension to improve your google search experience via Keyboard shortcuts. As of writing this guide, the Google Search navigator plugin is available for Google Chrome and Mozilla Firefox web browsers. Install it from the following links depending upon the browser you use. For Google Chrome/Chromium: Install it from the Chrome Web Store. For Mozilla Firefox: Install from the Add-ons for Firefox. Once installed, you will see its icon on your briwser’s tool bar. Now you can effectively search on the Google via keybindings. Now let me show you some examples, so you can understand it better. For instance, I am going to search for Abdul kalam books. To do so, I type “abdul kalam books” on google search bar. Here is the result from my Chromium browser. Did you notice the arrow in the first result marked in red color rectangular box? Yes! Google Search Navigator plugin automatically places the arrow key in-front of the first search result. To navigate to the next result, simply press the DOWN arrow key or j key in your keyboard. To go to the previous result, press wither the UP arrow or k. To focus back on the search box, press either / (forward slash near SHIFT key) or ESC key and change the search term if you like so. To open the search result in the current window, press ENTER or SPACE BAR. Sometimes, you might want to navigate to more than one search results. If so, press Ctrl+Enter or SUPER key+Enter (Windows key) or Ctrl+Space to open selected result in background tab. And, press Ctrl+Shift+Enter or Super key+Shift+Enter or Ctrl+Shift+Space to open selected result in new window/tab. Be default, google get you all results for your search term. You can shift from All results to other results, search images, videos, news results. For example, to display only image results, press i letter in the keyboard. You will now see the Images results only. Similarly, to display video results, press v, for maps press m, for news n.
Here is the complete list of currently supported keyboard shortcuts. ↓ (DOWN arrow key) or j : Select next search result..
↑ (UP arrow key) or k : Select previous previous result. / or ESC key : Focus on input search box. ENTER or SPACE : Navigate to selected result. Ctrl+Enter or SUPER key+Enter (Windows key) or Ctrl+Space : Open selected result in background tab. Ctrl+Shift+Enter or Super key+Shift+Enter or Ctrl+Shift+Space : Open selected result in new window/tab. ←(Left arrow) or h : Navigate to previous search result page. →(Right arrow) or l : Navigate to next search result page. 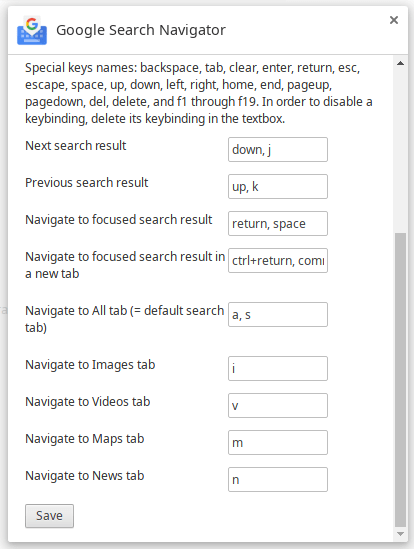 a or s : Navigate to All tab (= default search tab). i : Navigate to Images tab. v : Navigate to Videos tab. m : Navigate to Maps tab. n : Navigate to News tab. Just print out this keybindings and put it on your table or take screenshot and set as your wallpaper. So you can avoid visiting this page every time. You can change the keybindings as per your liking. 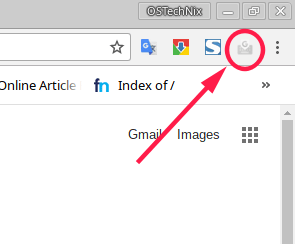 To do so, right click on Google Search Navigator plugin icon on the tool bar and click Options. You will see the following window. Change the keyboard shortcuts as you wish and click Save to apply the changes. I don’t know why google abandoned this feature. To me, it seems very useful feature. I can easily browse through the search results without moving my hands off from the keyboard and this plugin has slightly increased my productivity on google search. Give it a try, and you will know that I am not exaggerating. And, that’s all for now. Hope this helps. More good stuffs to come. Stay tuned!